Sale to include large selection of early football & basketball cards. Football cards include 1958-1961 Topps Magic Cards, 1959-1961 Topps Team Cards, 1959 Topps Pennant Cards, 1962 Post Cereal Cards, 1960 Football Highlights, 1977 Topps Chewing Gum Cards, & 1960 Fleer. Basketball cards to include 1961 Fleer. 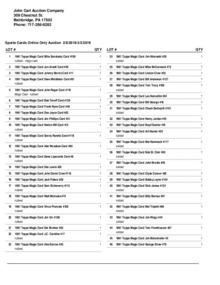 Click on green online bidding link below to view the online catalog with pictures or scroll below for a printable PDF file of the catalog. This will be an online/absentee only auction. There will be no live sale. Bidding will open on Friday February 8th and will end on Sunday March 3rd starting at 8:00PM EST. Come to preview & place absentee bids or bid online. Preview time is Friday March 1st 2:00 till 6:00 at 309 Chestnut St. Bainbridge, PA 17502. Pick up your items the week of Monday March 4th or have them shipped. Pickup times are Monday March 4th 10:30 till 5:00 & Tuesday March 5th from 8:30 till 3:30 or call 717-618-9727 to schedule a pickup if those times don't work. You must pickup or pay for your items by Saturday March 9th or they will be resold. Pickup at 309 Chestnut St. Bainbridge, PA 17502.